Compare tours in a similar category! 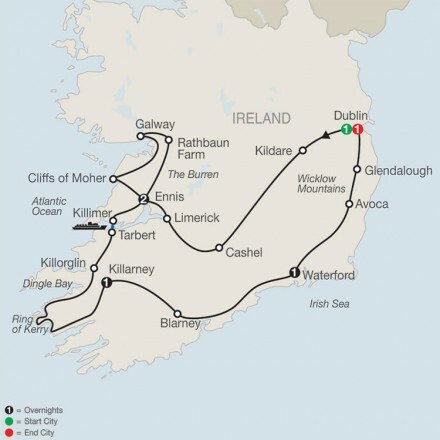 Dublin: See the Custom House, Guinness Brewery, Phoenix Park, Dublin Castle and the Georgian townhouses. Adare: See the main street lined with thatched cottages. 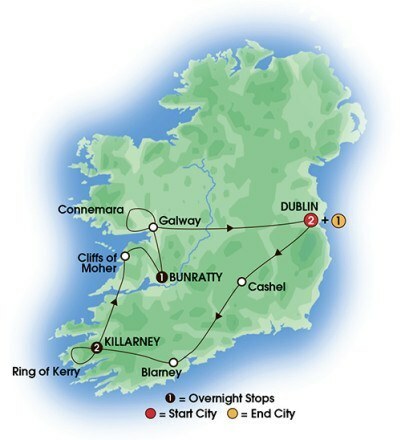 Cork: Enjoy an orientation tour. Galway: The luxurious Ardilaun House in Galway is located perfectly between the city and the Connemara coast. This country house hotel offers excellent accommodation and exceptional service. Killarney: Join John and Freda Sheehan for an evening of culinary delights in a beautiful setting. Enjoy great food and drink in a relaxed atmosphere while the master chef explains the secrets behind some of Ireland’s best loved dishes. Cork: Celebrate Irish style! Join in the ‘craic’ over dinner with fabulous local flavours and wine. Welcome Reception (WD), 6 full Breakfasts (FB), 1 Highlight Dinner (HD), 1 three-course Evening Meal with choice, or buffets, plus tea or coffee (D) and 1 Celebration Dinner (CD). Dublin: Breathe the air thickened by the musty tomes of Trinity College Library and admire the lavish Book of Kells, written and decorated by Celtic monks in the 9thC. Cliffs of Moher: Stop by the Exhibition Centre and look out over the Wild Atlantic Way from these majestic cliffs. Bunratty: Explore the Folk Park, a living museum which takes you back to the days of old Ireland. 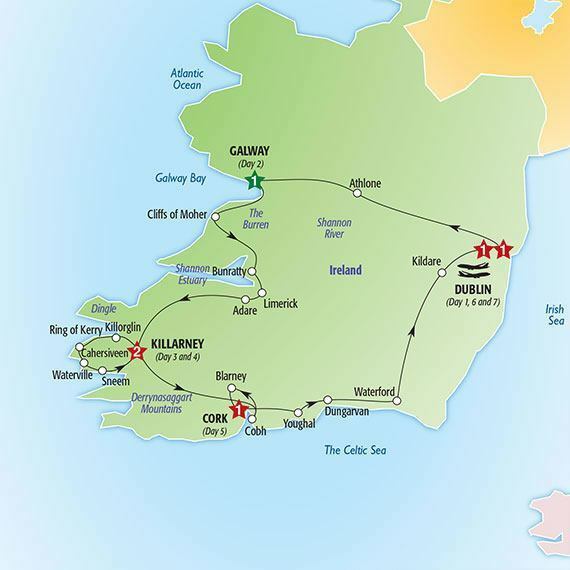 Killarney: Venture into a world of towering cliffs, lakelands and remote villages as you tour the Ring of Kerry. 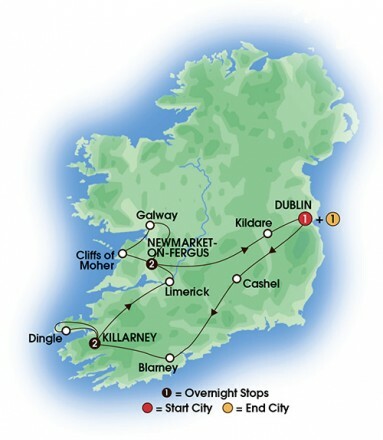 Killarney: See the hidden delights of Killarney on a famous jaunting car ride. Ramble along with your local ‘Jarvie’ who informs you of the history, legend and folklore of the area – with some Irish wit thrown in for good measure! Cobh: The Queenstown Story at Cobh retraces the steps of Irish emigration from the famine of 1845 to the great ocean line era of the 1950’s. A must for those with Irish ancestors who crossed the Atlantic at this time. Cork: Visit the English Market and meet a local market stallholder. 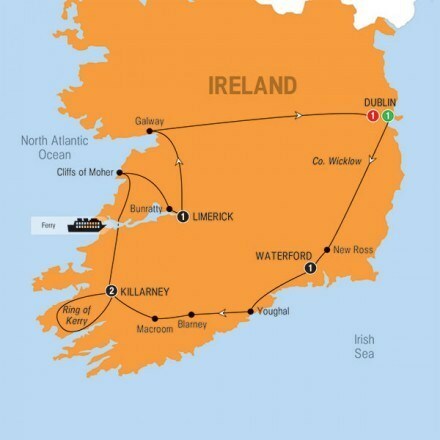 Waterford: A guided visit of the crystal factory. Kildare: Join an equine professional for a behind the scenes look at the Irish National Stud and follow the ‘journey of life’ through the Japanese Gardens, starting from the ‘Cave of Birth’ to the ‘Gateway to Eternity’. An expert Insight Tour Director – at the pinnacles of their careers, will smooth your way throughout your journey. They are your ‘travelling concierges’, expert guides, consummate organisers and friends in a foreign land. Insight motorcoach – Enjoy the unique comfort of Insight’s luxury air-conditioned 40 seat coach with extended leg room and on-board restroom. It’s business class comfort. Personal radio headsets – gives you the freedom to wander during visits to famous highlights without missing any of your local expert’s fascinating insights and commentaries. Baggage handling everywhere – with seamless and prompt delivery to your door at every hotel. Hotel and restaurant tips included – you’ll never have to worry about how much to give, nor search for foreign currency. Plus we include all taxes and porterage charges at hotels. Complimentary WiFi – the majority of Insight hotels have free WiFi access in lobby or bedroom areas. You will also find that WiFi is generally available on most touring coaches. Insight Flourishes – from time to time, your Tour Director will enchant you with local tidbits, each representing authentic food or beverages unique to the destination. Included airport transfers at scheduled times on arrival and departure days.